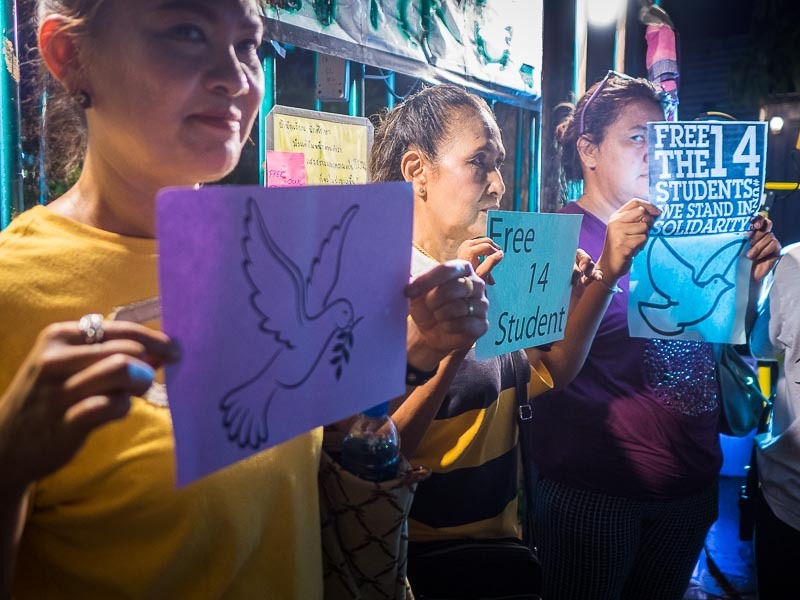 Protestors at Thammasat University in Bangkok demonstrate Monday night on behalf of the 14 students arrested by Thai security officials. 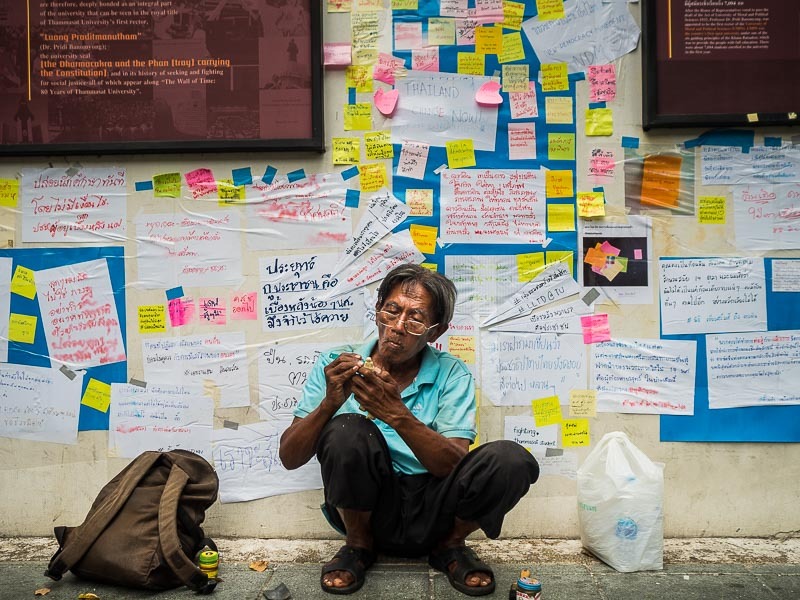 Small numbers of protestors, tiny really, are back on the streets in Bangkok. 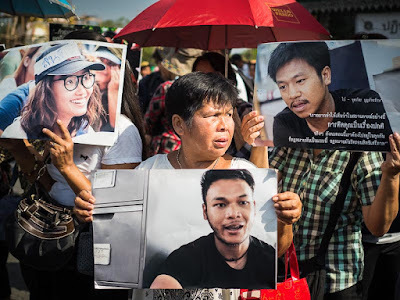 There were a couple of small protests against the coup on May 22, the anniversary of the military overthrow of the civilian government. Some of the students were from Bangkok, others from upcountry. The students' arrest was a flashpoint and ignited protests in Bangkok. At a protest at Thammasat University, a protestor ties paper doves to a line of paper doves during a protest called "Wings of Peace." 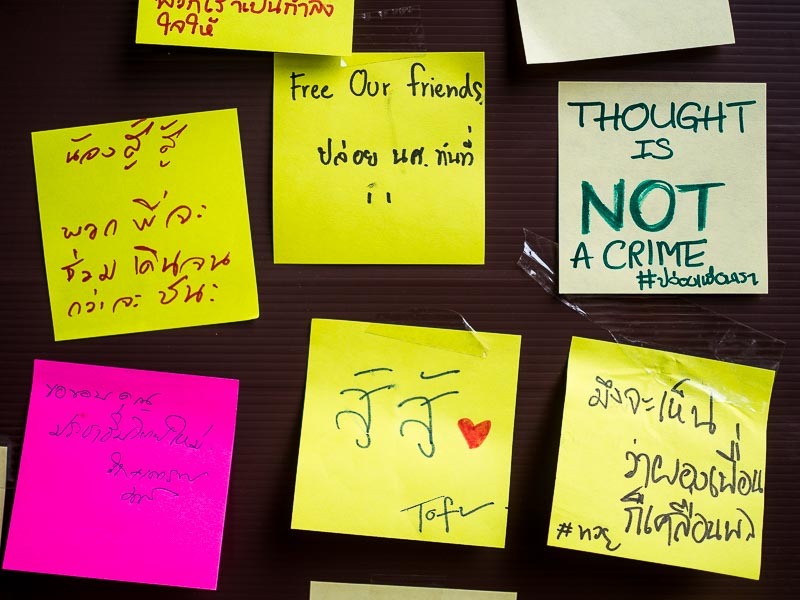 Protestors used "Post-It" notes to express anonymous opinions. 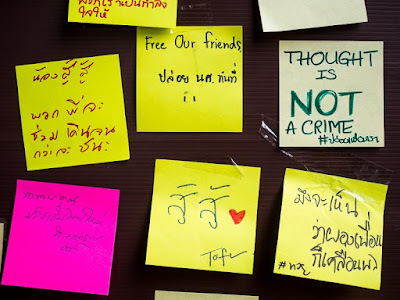 The "Post-It" notes were put up at a couple of locations around Bangkok and some towns upcountry. The protests were not very big. Probably 100-200 people (in a city of 12 million). 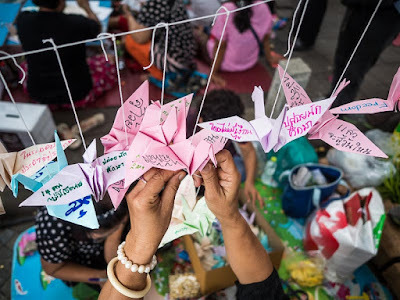 Anti-coup protests last year drew thousands. Anti-government protests early in 2014 drew tens of thousands and the Red Shirt protests of 2010 drew hundreds of thousands. So 100-200 protests on a university campus may not seem like much. It's significance though is that these are the first sustained protests since the coup. 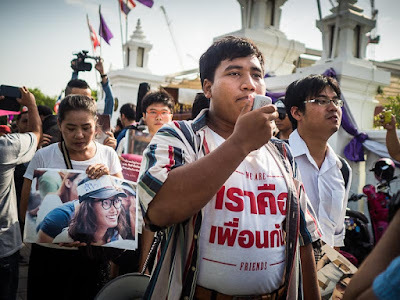 In the last two weeks students held several protests at the Remand Prison, where the 14 were held. They had a spontaneous, sort of flash mob, protest at the National Stadium BTS station, and a series of protests at Thammasat University. Police and plainclothes military officers watched the protests and protestors but didn't intervene. A man makes wooden toys in front of a wall of "Post-It" notes protesting the students' arrest. The students were held for almost two weeks. When their two week pre-trial detention period was up, the military courts declined to extend the detention and the students were released. Student protestors march to the military courts to support the 14 in detention. 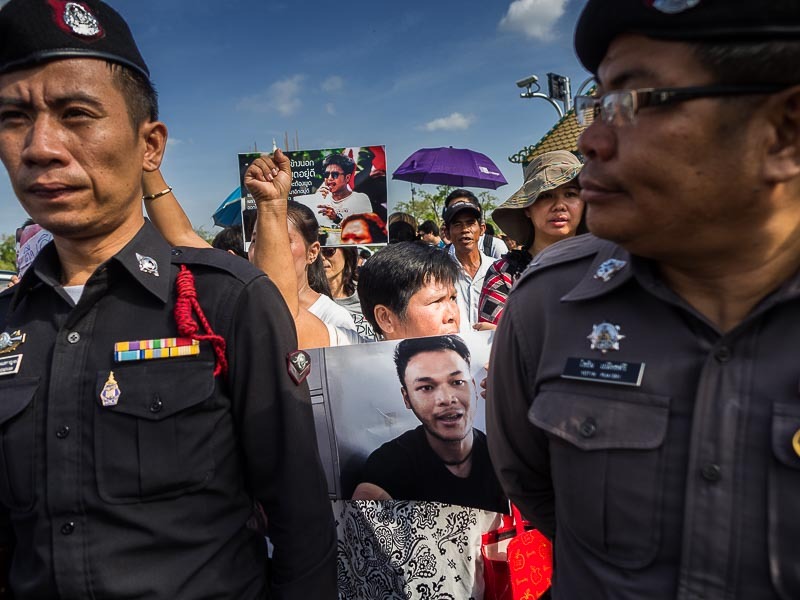 About 100 people gathered in front of the Ministry of Defense during the military court hearing Tuesday. They were not acquited. They still face trial on the original charges and officials continue to monitor them. More charged could be filed against them. 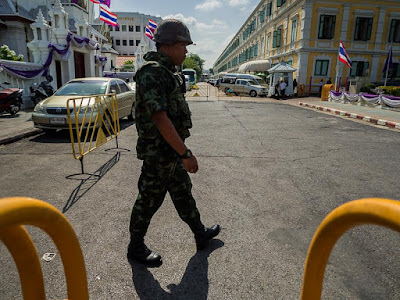 A soldier on duty in front of the Ministry of Defense. At the Ministry of Defense police tried to cordon off protestors. The protestors held photos of the 14 and chanted. The students say they're not giving up and intend to continue their struggle. Protestors hold up photos of the detained students during the protest at the Ministry of Defense. 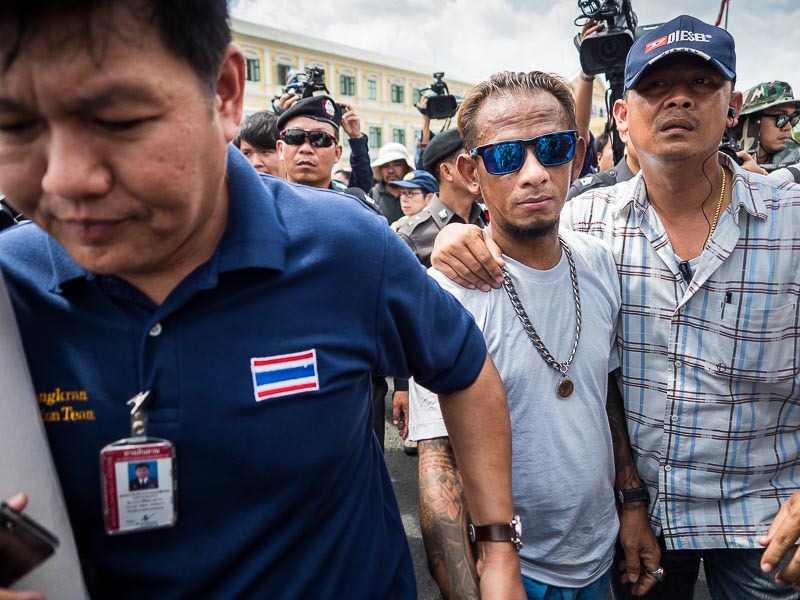 Plainclothes security agents (left and right) arrest a man (center). The man had stood in a corner of the protest area and unfurled a small banner. As soon as he held up the banner security agents whisked him away. Nobody is really sure what's going to happen next. The students say they plan to continue to protest and the protests don't pose a threat to the government. There are more photos of the protests in my archive or available from ZUMA Press.